Mechanically robust cationic cellulose nanofibril 3D scaffolds with tuneable biomimetic porosity for cell culture. COURTENAY, James C.; FILGUEIRAS, Jefferson G.; AZEVÊDO, Eduardo Ribeiro de; JIN, Yun; EDLER, Karen J.; SHARMA, Ram I.; SCOTT, Janet L.
Abstract: 3D foam scaffolds were produced in a "bottom-up" approach from lyophilised cationic cellulose nanofibril (CCNF) dispersions and emulsions (CCNF degree of substitution 23.0 0.9%), using a directional freezing/lyophilisation approach, producing internal architectures ranging from aligned smooth walled micro channels, mimicking vascularised tissue, to pumice-like wall textures, reminiscent of porous bone. The open, highly porous architecture of these biomimetic scaffolds included mesopores within the walls of the channels. A combination of SEM and NMR cryoporometry and relaxometry was used to determine the porosity at different length scales: CCNF foams with aligned channels had an average macropore (channel) size of 35 9 mm and a mesopore (wall) diameter of 26 2 nm, while CCNF foams produced from directional freezing and lyophilisation of Pickering emulsions had mesoporous walls (5 3 mm) in addition to channels (54 20 mm). 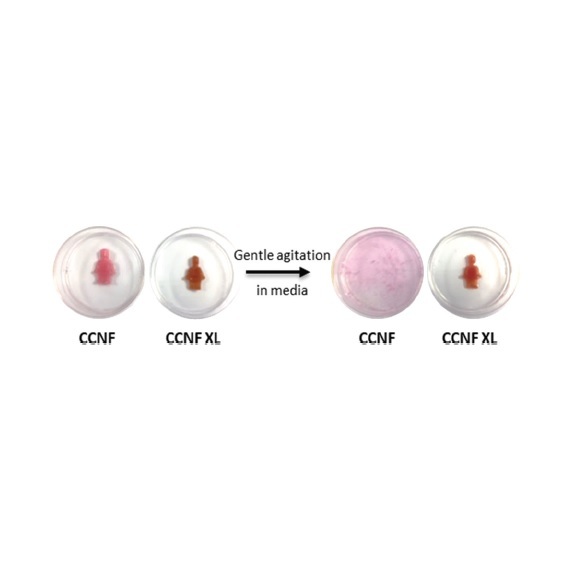 Glyoxal crosslinking both enhanced robustness and stiffness, giving Young's moduli of 0.45 to 50.75 MPa for CCNF foams with degrees of crosslinking from 0 to 3.04 mol%. Porosity and channels are critical scaffold design elements for transport of nutrients and waste products, as well as O2/CO2 exchange. The viability of MG-63 cells was enhanced on crosslinked, mechanically stiff scaffolds, indicating that these exquisitely structured, yet robust, foams could provide biomaterial scaffolds suitable for industrial applications requiring 3D cell culturing.